A couple of weeks ago, moments after Motorola took out a full page ad in a variety of newspapers to do a somewhat formal announcement of the Moto X and the idea of it being the first customizable phone, pictures of its potential custom color choices surfaced. Those colors, assuming the images were legit, included a light blue, red, purple, and an incredibly bright green. So far, these have been the only images of colored Moto X parts outside of the white and black versions that have been pictured left and right. So while we loved the idea of the Moto X being customizable, we had yet to see much proof outside of those original back plate pics. Well, thanks to Moto evangelist Guy Kawasaki, who posted up pictures of a little Moto party at corporate headquarters last week, we now know that the green color from those pictures exists and is already in use by what we would assume to be a Moto employee. 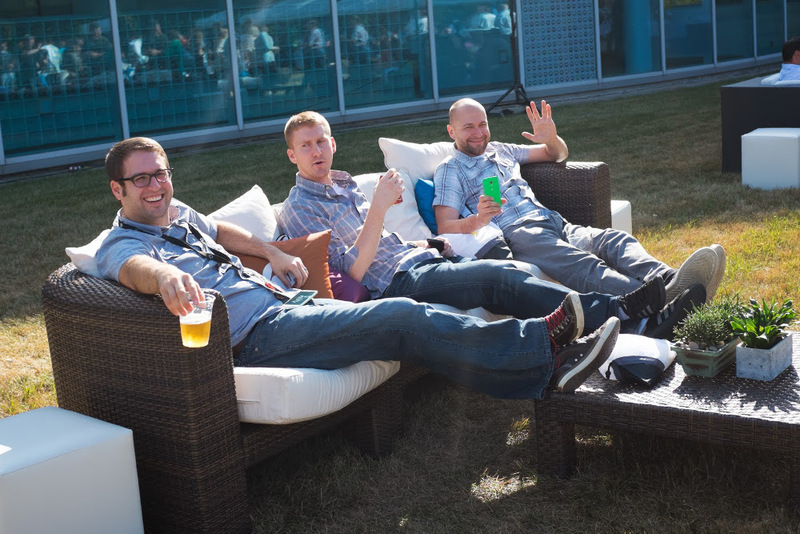 As you can see in the picture above, we have three guys sitting on an outdoor couch, enjoying a pint, some Motorola branded pillows, and the sun in Libertyville. But if you look close enough, you’ll notice a green beacon of light presenting itself as the true star. Yes, that is indeed a Moto X in the same green color we saw back on July 3. You can see the centered batwing “M” logo, camera lens, and flash, along with a speaker grill set to the right of the camera. Also, the other two gentlemen seated next to Mr. Green, may have Moto X phones as well, in both black and white. But it’s too hard to tell from this picture. So, there you have it. The green back we saw a few weeks ago was real. Since it was coupled with pictures of red, purple, and blue backs, there is probably a pretty good chance that those will be color options as well. Now, to find out the details of how this customization will go. If we don’t know before Thursday, we’ll definitely know on Thursday. Update: And just like that, Guy has since pulled the photo.